As soon as time permits, I will write the most detailed and glorious review on Austrian ski resorts and skiing regions that the web has ever seen. I promise. For the time being, however, I have to prioritise other things, since the time that I can spend on TourMyCountry.com is rather limited. A short outline of areas suitable for beginners, intermediate and advanced skiers is given in the main article on "Skiing in Austria". 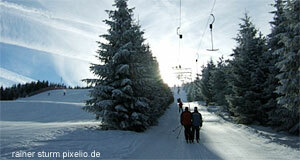 The following list gives the names and some very basic information on skiing regions. It might be useful for further reading on- or offline or to request information from the official tourism website. Note also specialist articles on Ski Amade (the biggest ski area in Austria) and "underrated" or rarely known ski areas. Here you will find the areas mostly suitable for the serious skier: Steep and challenging slopes, extra-long seasons and the oldest skiing culture in Austria. Here the young crowds grow happy: The best après-ski parties come with good slopes on several degrees of difficulty. The snow situation is generally good and so is the infrastructure. A gradient of steepness makes Salzburg a varied region for skiing: Family friendly in the north, much more demanding around Badhofgastein in the south. Offers access to several spas for a day off in hot water. The "family friendly" regions: Apart from the Dachstein area, most skiing regions of the East are gentle and suitable for beginners and intermediate skiers. The infrastructure targets families with kids and Viennese that don′t want to drive too far.